The colors are beautiful, as are the clamshells. There is not a lot of sauce, but the flavor of the wine is present. 1. Bring a large pot of salted water to a boil over high heat. Add the pasta and cook until tender but still firm to the bite, stirring occasionally, about 8 to 10 minutes. Drain pasta. 2. Meanwhile, heat the olive oil in a large heavy skillet over medium heat. Add the shallots and the garlic and cook for 3 minutes, until tender but not brown. Add the sun-dried tomatoes and cook for another minute. Add the wine, shrimp, and clams. Bring the liquid to a boil. Reduce the heat and simmer, covered, until the shrimp are pink and the clams have opened, about 7 minutes. 3. 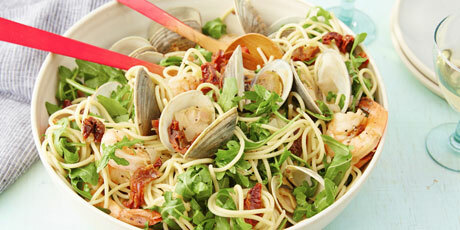 Add the spaghetti to the seafood mixture. Add the salt and pepper and stir to combine. Add the arugula. Stir gently and place on a serving platter. Serve immediately.